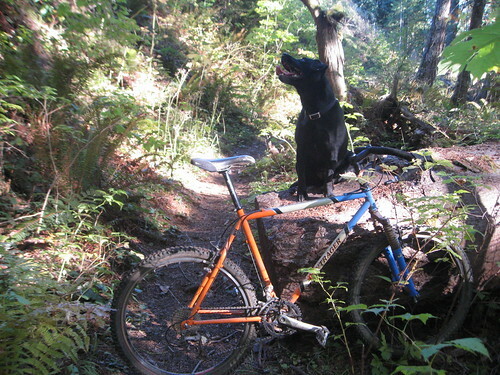 bontrager and dog, originally uploaded by BikeTinker. A ride around Rainbow Lake, and up into the logging roads with the dog. Right there is some serious satisfaction. Nothing is permanent, and everything regenerates. Dogs and bikes don’t last forever, and neither do people. This section of valley has been logged five times in the last 150 years, and it’s still beautiful. Take your loveliness where it comes. Previous Postchick at the Pacific City duneNext Postsilly dog!